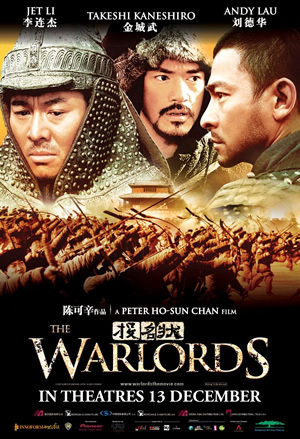 This entry was posted in Actors, Battle, Brotherhood, China, Movie, Reviews, War Movie and tagged Brotherhood, China, Epic Battle Scenes, Jet Li, Movie Trailer, Movies, Reviews, War Movies, Warlords. I’m glad you liked it a lot, I thought it was good. I believe in that movie, one character says 40 million Chinese died in the civil wars, sure is a lot, maybe that is exagerrated. I thought I read you say this above but I can’t find it, perhaps this is movie is a bit like the 300 or Three Hundred, that movie, where things are slightly exagerrated or made like a myth. Chinese history seems to be interesting since the population is so big and has been and the civilization is so old. Just a tie in to of all movies, Grand Torino, I studied a little bit of Hmong history. Most of the Hmong in the USA came from Laos as the Hmong are central to the Grand Torino plot. But those Hmong left China because of the upheaval in China and probably in centuries close to the time of this movie. Hmong still live in China too where they are known as the Miao. It’s all real fascinating history, unfortunately, I guess the Hmong/Miao may have been persecuted in China. As I said that is history I don’t know. I’d like to see the Hmong in a war movie. Actually, one of my favorite war movies is Bridge over River Kwai because tribal like peoples help the Allies in the jungle. A bit like what the Hmong did in the Indochina war. Of course, though that part of the Bridge over the river Kwai may have been when they were traversing through Burma or Siam or Thailand, the Hmong actually dispersed into many countries and besides that, there are a number of these types of tribes from what I understand in Asia, not just the Hmong. 40 million sure sound like a lot. But it is such a massive country. Will have to investigate. Before the “cultural revolution” this was certainly one of the most refined cultures. Japan was influenced a lot and not the other way around. I think there might even be Hmong in Cambodia. Anyway you are giving me ideas. I will see if they are in one of the French movies on Indochina. I have only seen one or two but there are some more. I must admit I have not re watched The Bridge on the River Kwai but will soon. It is too long ago to remember properly. Let me know, if you find out anything on your side. When I studied cultural anthropology we had a course on warfare and we learned that the trenches were an invention of the Maoris of New Zealand… A very belligerent people. Anyway, would be interesting as a movie topic. Soon I will watch Mongol, the rise of Ghengis Khan, he and Attila the Hun would seem to be exciting subjects for movies. I think in this Mongol movie, they are speaking Mongolian. Looks good so far. I’m not sure you have reviewed it. Not yet. As a matter of fact I wanted to watch it this weekend.